Looking back, I have some fond memories of Halloween over the years. When I was in 5th grade I went to a friend's house to go trick-or-treating and there was such a bad snowstorm that I was stuck there for a day or two until the roads were clear enough for my parents to come and get me. My freshman year of college all of my friends and I wanted costumes that coordinated (and were cheap) so we each wore a different solid color and went as a rainbow - I was green. We used face paint to draw a rainbow on one cheek and then an item of our color on the other cheek - I remember being at a party where this guy kept asking me if I was Rainbow Brite. "Green! I'm green!" I said, gesturing at the rest of the colors. He didn't get it. But now that I have children, I look forward to Halloween for the memories that are made of them in their adorable costumes having so much fun. The photos themselves make the holiday one that I anticipate every year. They're like two peas in a pod, those two. Get it? Like two peas in a pod? Not funny? Okay, fine. So when it comes to cute ways to make Halloween more fun, I'm all for it. Having been introduced to Pear Tree Greetings and getting to host a personalized notecard giveaway for them already, I know that their stationary items are always modern, fresh and affordable. The designs are stylish, the results are high quality and the price is right - what more could you ask for? 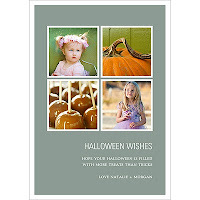 For this Halloween, Pear Tree Greetings wants to make your holiday even more spooky and fun with their great collection of Halloween Photo Cards and Halloween Invitations. If you're having a party or just want a creative way to show off your little darlings dressed in their adorable threads, you'll love the creative options that they have to offer. Or, for a charming little way to celebrate October 31st, the Halloween Personalized Stickers from Pear Tree Greetings are just right for bringing out the Halloween spirit in many different ways. Adorn your trick-or-treat bags, have your child hand them out at school or include them in a note when you send photos to family and friends. It's up to you! Considering these stickers are able to be personalized however you choose, the only thing left to do is decide between all of the fun styles that are available. Wouldn't one of these be cute? Actual sticker size is 2.25 x 2.25"
Available in sets of 12, Halloween Personalized Stickers from Pear Tree Greetings cost $2.99 each, a pretty reasonable price considering you can customize them precisely how you want them - even add a photo! This October, your goodie bags or party favors will never look better! One lucky person will win 2 sets (24 in total) of Halloween Personalized Stickers from Pear Tree Greetings! A big thank you to Pear Tree Greetings for providing two sheets of Halloween Personalized Stickers for one lucky giveaway winner. The opinions shared are my own and honest if you really need to see more, click here to see how I roll. Oh my goodness, they are so adorable, don't enter me in this contest but be on the lookout for an email from me later on with a photo attachment! My favorite part is the candy corn & pumpkin decorations. I entered the Weather Direct giveaway. I don't know if it is a favorite memory...but... growing up in Chicago it seemed EVERY Halloween was COLD and RAINY and we all had to wear COATS over our costumes!! I left them your MESSAGE on the FB wall too! I love helping my girls get ready for the big night of trick or treating! As a child, we always put our costumes on early and went trick-or-treating to our grandparents houses before heading out to the neighborhood with the rest of the kids! Pear Tree Greetings Facebook Fan. Entered Halloween Sock Gram Giveaway. I LOVE dressing up! I plan for months our next halloween costumes! love dressing up! my fave memory was a cute costume I got for my little one which which was liger I guess. no one could tell what is was other than a critter of some sort, but I was a proud mamma! Our family has always been really into Halloween. We had an annual pumpkin carving party that I am attempting to carry on. Love it! 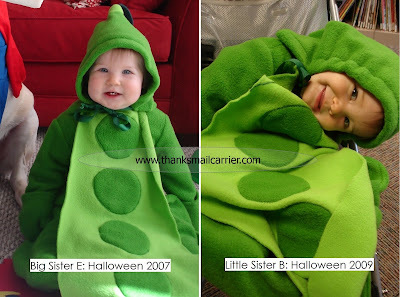 I love getting my kids matching/themed costumes each year - so, so fun! I have a lot of memories of my mom helping us make costumes, mostly out of things we already had. For example, a stuffed monkey became the inspiration to make an organ grinder costume. I trick or treated until I was 18. Shhhh. LOL. MANDATORY ENTRY: My FAVORITE Halloween memory is when I was seven years old, my Aunt made my costume. I was a VERY cute green turtle. It was the cutest costume I ever wore out of all my Trick or Treating years. My Aunt was such an awesome seamstress! Gosh, I am so jealous of her talent. When me and my brother were done trick-or-treating we would organize our candy down the the colors! LOL! And we made a pile of candy we didn't like and each took a turn picking one from the pile until we were totally even. It was so funny, good memories. i always loved the costumes my mom made for me. they were awesome! My mother would hand me and my 2 brothers a pillow case and give us 1/2 hour to trick or treat. We would run madly from house to house screaming in excitment for each other to hurry. Didn't have time to eat any candy as my mother well knew. My favorite part is the roughly 1 minute we convince the cat that wearing a costume is worthwhile during treat eating. She was a lobster last year. I remember my favorite halloween costume - I was a black cat. My mom made the costume and it was PERFECT. I could not have been more than 5 but --- I STILL have the costume after all these years. Think if my kids try to wear it it will fall apart in their hands? The candy is my fav part! I love just about everything Halloween, the decorations, the costumes, the candy, the parties, the fun foods and activities. I love shopping for costumes and making my girls happy with their selections.